You might not be drawn to Teach To Work unless you are in the teaching or mentoring arena. If that’s not you, stay with me anyway. This book has good things to say about how we train and teach the next generation. This will be important for us as business people and families. 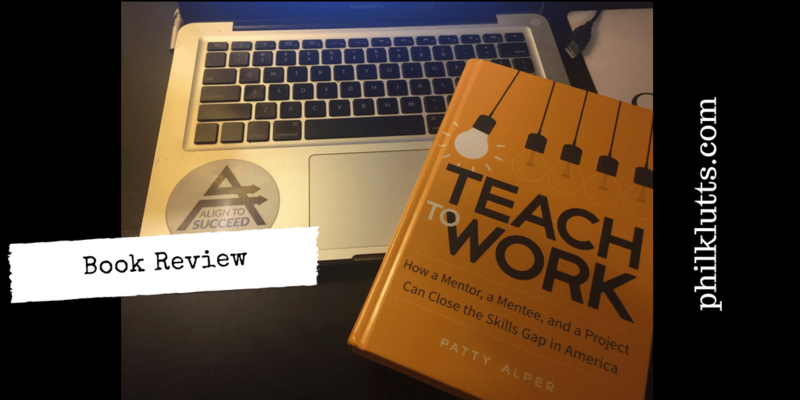 Written by Patty Alper in 2017, Teach To Work outlines what she has learned and how to be successful in guiding younger generations to be successful in the world. Alper hits the ground running in the introduction and first chapter by outlining why mentorship is so important and how it benefits students, mentors, and the companies that sponsor mentors. Her insights aren’t just her own subjective results. She cites research and publications like the Harvard Business Review. She also includes company testimonials from the likes of Starbucks, Pfizer, Ernst & Young, 3M, and more. Chances are that if these folks are seeing benefits then it is probably good for your business as well. The book goes beyond advocating for mentorship. Teach To Work is about project-based mentorship that provides students with the skills, social interaction, and emotional support to do big things and prepare for the working world after school. Alper goes into the how-to after outlining why mentorship is important. Part Two of the book is chalk full of tips, examples, and knowledge to get you started or help you become better at mentoring students in a project-based environment. Improving my project-based mentorship is exactly why I picked up this book. About a year ago, I had the privilege to help Oklahoma Christian Academy start a project-based class to help students contribute to the world around them. Students brought ideas to the class for business, non-profit ventures, and social endeavors. I was pleased and honored to help the teacher and the administration develop this course and mentor the students. Teach To Work will help us propel this concept into new depths and greater contribution in the years ahead. You may not be as involved in mentoring students, but this book is still a great bank of knowledge. If you are in business or have children then I recommend picking up a copy or at least exploring the ideas and resources available. Closing the skills gap helps us all ensure the future will be bright! I’d love to discuss this topic more if you are interested. You can reach me at phil@philklutts.com or on LinkedIn. Find more from Patty at http://teachtowork.com/. “College graduates who had mentors encouraging their goals and dreams, internships, or long-term projects where they applied what they are learning, double their odds of achieving a great job and a great life compared with their peers who did not.” – Page xv, forward by Brandon H. Busteed of Gallup, Inc.